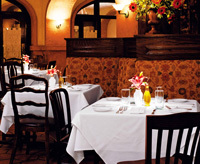 Located in the heart of the Loop's Theater District, Trattoria No.10 is intimate and impressive with its artistic and romantic Tuscan décor and perfect for pre-theatre dining. The contemporary Italian menu changes daily. "Handmade ravioli is the kitchen's specialty; those filled with lobster or squash are particularly renowned," says Fodors. 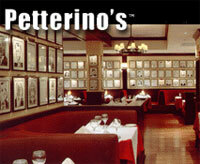 "Outstanding Italian menu and one of Chicago's 20 most popular restaurants," says Zagat. "One of the Loop's premier dining spots," says The Chicago Tribune. Private party rooms available. In the heart of Chicago's theatre district, 312 Chicago offers a contemporary Italian menu accentuated with family recipes that have been passed on from Chef Dean Zanella's Italian relatives. Nine debuted in Chicago in April of 2000. The positive reception by the media has graced Nine with many reviews and accolades, including Nine named best new restaurant of 2000 by Chicago Magazine. 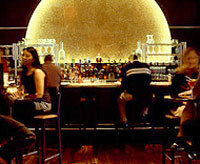 The Chicago Sun-Times labeled Nine, Chicago's hottest restaurant. According to the Chicago Tribune's 3-star review, Nine is "a restaurant that's loaded with so much visual flash and so many luxury dining ingredients"... and the restaurant offers "a singular dining experience - even though it's a straightforward steak-and-seafooder at heart". Named for Arturo Petterino, maitre d' at the Pump Room in the days when it swarmed with celebrities, this Chicago steakhouse re-creates the feeling of downtown dining in the 1940s and 1950s. The dimly lit dining room is decorated in dark wood with red leather booths, and the overall feel is relaxed rather than hyped-up. The straightforward menu is filled with classic American big-night-out favorites: veal chops, New York strip steak, slow-cooked beef brisket, and some fresh fish selections. In the heart of the Financial District and across from the Lyric Opera House, Lloyd’s has moved 1 block west to 1 S. Wacker. The revamped menu features eclectic American cuisine, now with an Asian flair. 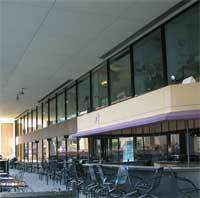 The Frank Lloyd Wright inspired interior boasts a spacious bar, booth seating and window seating. Take in the panoramic view of the city from the second floor of the Renaissance Hotel while dining on contemporary American cuisine at the Great Street Restaurant & Bar. 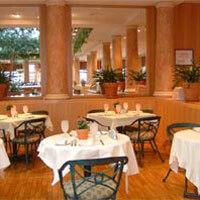 Breakfast and lunch buffets are offered along with a full menu for every meal. 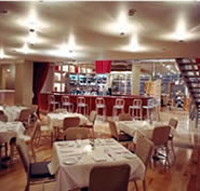 The Theatre Dinner Package is a great deal and making reservations would be a good idea. BIN 36 Chicago is open for breakfast lunch and dinner daily and features contemporary American cuisine with an emphasis on seasonal ingredients and wine pairing. 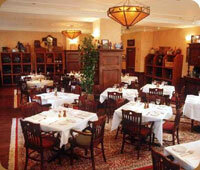 In the evenings, you may dine in either the more casual Tavern dining room or the intimate Cellar. The 50 selection cheese menu is available throughout, as well as a prix fixe Chef's Tasting menu with wine pairings that changes daily. Park Grill is Chicago's newest destination restaurant at the gateway to Millennium Park and along Chicago's world-class Michigan Avenue. 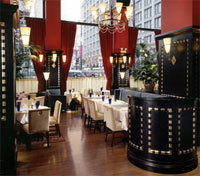 Park Grill's cuisine and seasonal year-round entertainment make it an experience unlike any other in Chicago. Executive Chef Bernard Laskowski brings a chef's interpretation to classic American cuisine, infusing it with unique Chicago flavor. When you sit down at the restaurant, the outdoor area, or the café, you can start a conversation, start a meal, start a business deal, or start a celebration. 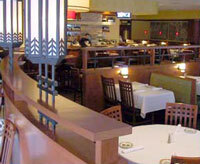 Rivers, located on the lobby level of The Chicago Mercantile Exchange Building, is one of the Chicago Loop's most popular restaurants. 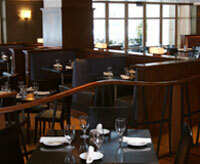 Rivers offers creative, seasonally changing contemporary American cuisine with influences from around the globe. Rivers is an all occasion venue featuring a relaxed yet upscale dining room & a large outdoor deck for alfresco dining during warm weather months. 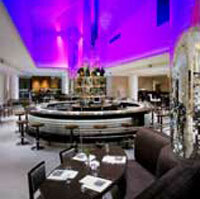 Aria provides a contemporary twist on conventional comfort foods. Using American flavors and ingredients to update traditional dishes from around the world, aria defies regional dining, creating a distinctive experience that is both culturally inspired and comfortably American. Guided by executive chef Noah Bekofsky, and inspired by flavors and techniques found throughout the world, at aria you'll find a menu that transcends any one cultural tradition. 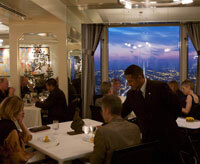 Soaring above Chicago's skyline on the 40th floor of One Financial Place and under the culinary direction of Chef/Owner Jean Joho, Everest serves some of Chicago's finest personalized cuisine. "Though the restaurant has a spectacular unobstructed cityscape as a backdrop, the food is what commands attention," said Chicago Magazine, which has voted Everest four stars for the tenth year in a row, since Everest opened.